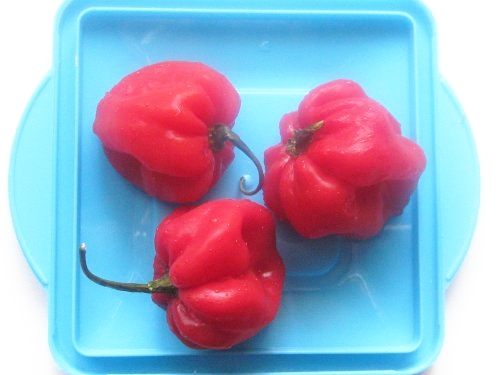 Ji Abubo is one of the most traditional Igbo delicacies. I look forward to a visit to grandma's place because I am sure to eat either Ji Abubo or Abacha when I get there. Prepare this for the traditional Igbo man in your life and he will fall in love with you all over again! Puna yam is sweet and starchy and is the yam we use for most Nigerian yam recipes. The pumpkin leaves stated above are not halloween pumpkin leaves. They are Nigerian pumpkin leaves: Telfairia occidentalis. If you do not have those, use spinach. That's what I used in the video below with great results. Add palm oil till you get the consistency you like. For the authentic taste palm oil is very important to this recipe, vegetable oil or any other oil cannot be used as alternative. Ogiri Igbo gives the sauce the very traditional taste. If you do not have it, use stock cubes. Wash the yam thoroughly with plenty of water and a sponge. Do not peel the yam. Slice into desired shapes and sizes for example the half-moon slices. Rinse the ukpaka and place in a foil bag or plastic bag. My grandma uses leaves to wrap the ukpaka. Wash the vegetables and tie them up with strings. 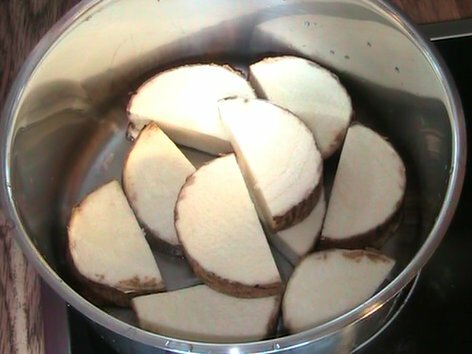 Put the yam pieces in a pot and pour water to cover the yams. Place the tied vegetables and wrapped ukpaka on top and cook till the ukpaka and vegetables are soft. Continue cooking the yam if not done. Pound the habanero pepper in a mortar till smooth. 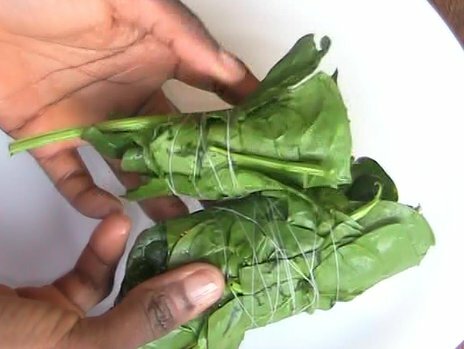 When the ukpaka and pumpkin leaves are soft (from step 2 above), pound them in the same mortar one after the other till they are as smooth as possible. Add palm oil to the blend till you get a consistency you like and mix very well. Add salt and ogiri Igbo to your taste and mix with the pestle till everything is well incorporated. Dish in a serving bowl and set aside. 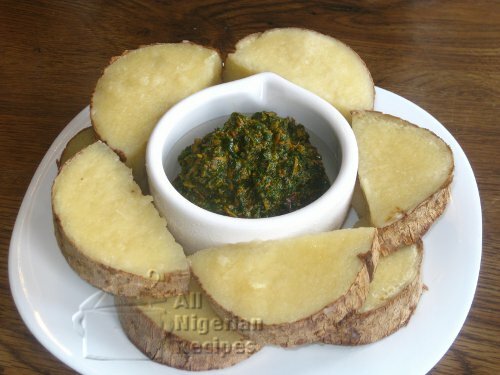 Once the yam is well done, decant the water and place the yams in a serving plate or tray. Ji Abubo should be served piping hot to complement the cold vegetable sauce.